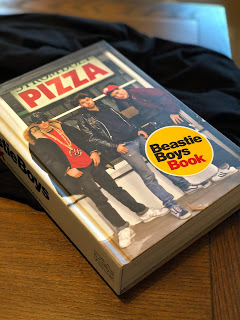 I am about halfway through reading the Beastie Boys Book, which I recommend heartily. The early chapters are my favorites – Ad-Rock and Mike D are particularly adept at summoning the ghost of New York City in the 1980s, with all of its dangers and possibilities. I am not generally given to nostalgia for the New York City of this era -- I thought it was bad when Washington Square Park was an open-air drug market and you couldn’t walk down 42ndStreet without being approached by prostitutes. But Ad-Rock and MCA highlight some important elements of the ‘80s that are worth celebrating. Most notably, the 1980s in New York was a time of cultural cross-pollination, as punk met new wave met disco met rap (among other things). For example, in 1982, a DJ from the Bronx, Afrika Bambaataa, transformed “Trans-Europe Express” by the German electronic band Kraftwerk into the groundbreaking hip-hop single “Planet Rock." These kinds of mash-ups, which were happening seemingly every few weeks, were a big part of what initially attracted me to hip-hop. It was positively dizzying to see a new musical genre emerge from the shards of other, earlier genres. On Licensed to Ill, the Beastie Boys’ debut album, you could hear bits and bobs from Trouble Funk, Led Zeppelin, War, the Clash, and dozens of other groups, all stirred together into something new and different. This kind of borrowing doesn’t feel possible today given the legalities/costs of sampling and the current obsession with cultural appropriation. Licensed to Ill came out in 1986. I was 19 years old, a Washington DC kid going to school at Wesleyan University. Anyway, the next day, I went to catch a cab. I was trying to get to Port Authority so I could take a bus back to school in Connecticut. No doubt I looked like what I was: an easy mark. Any real New Yorker will know what comes next. I took out my wallet to give him five dollars. As soon as the wallet came out of my pocket, he grabbed it and started running. I took off after him. I know not what I would have done had I caught him. But try to catch him I did, sprinting after him for blocks. I was fueled by pure desperation. These were the days before cell phones. Without my wallet, I had no money, no ID, no credit cards…no way of getting back to college. I thought I was gaining on the thief when he turned the corner off the avenue and onto a side street. As I followed after him, I came crashing into an elderly woman with a shopping bag, nearly knocking her over. The chase was over. I apologized profusely to the woman. She asked me what happened. I told her my sob story. After she had composed herself, she instructed me to walk with her. I thought I was doing her a favor, accompanying her to ensure that no further harm befell her on her shopping trip. But when I looked up, we were at the Port Authority. She took some bills out of her purse and gave me enough money to buy a bus ticket to Middletown, Connecticut. I didn’t ask her name or get her address. I never saw her again. But needless to say, I will never forget her kindness. The moral of the story: New York taketh away, but it also giveth. The ‘80s had some bad bits, but some good bits too.